Olivia made a rare double landfall over west Maui and Lanai as a tropical storm on Wednesday, triggering torrential rains and significant flooding in some areas. That brought down trees, closed roads and knocked out power to thousands. Hawaii News Now. Isles appear to dodge major damage from Olivia. Tropical Storm Olivia blew through the Hawaiian Islands Wednesday but not before leaving a soggy trail of fallen trees, swollen streams, landslides and power outages. Star-Advertiser. Trump signs disaster declaration for Hawaii as weakened Olivia dumps rain on Islands. Pacific Business News. Gov. David Ige’s request for a Presidential Disaster Declaration for Tropical Storm Olivia has been granted, one day after the request was submitted. Maui Now. 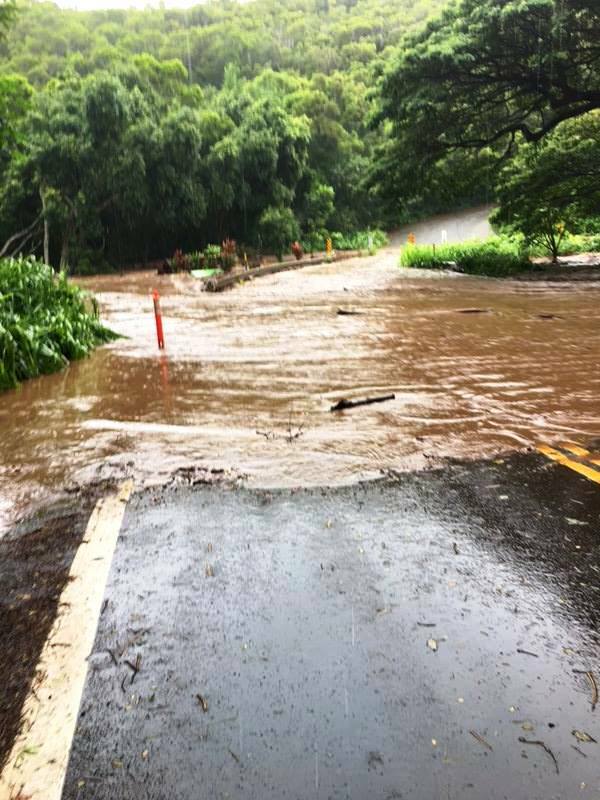 Maui County under flash flood warning; flash flood watch remains in effect for state. Star-Advertiser. Things are slowly returning to normal now that Tropical Storm Olivia is moving away from the state. Hawaii News Now. All public schools open Thursday except Kilohana Elementary on Molokai. KHON2. The U.S. Postal Service announced that all Post Offices across the state will be open and mail will be delivered, weather and local conditions permitting, on Thursday, Sept 13. KITV. Tropical Storm Olivia dropped almost 8 inches of rain on a part of Maui and lashed the Lanai airport with 51 mph wind gusts Wednesday, while the Big Island dodged a bullet. Tribune-Herald. As Maui County weathered winds that wrenched trees from the ground and rains that raised the rivers Wednesday afternoon, people on Kauai watched the skies. Garden Island. It’s shaping up to be an unpredictable hurricane season in Hawaii, with cyclones approaching from multiple directions — and there’s still six weeks left until it comes to a close on Nov. 30. Star-Advertiser. Shelters offer storm cover for the few who turned up. There were a total of 75 people across 15 evacuation centers on Oahu, Hawaii island and Maui County as of Wednesday morning, according to the Red Cross. Star-Advertiser. Political action committees that can raise unlimited funds already have formed to try to persuade voters in the debate over whether to amend the Hawaii Constitution in November to allow the state to tax investment property to help fund public education. Star-Advertiser. More than 80 candidates running for elected office this year have been fined by the Hawaii Campaign Spending Commission for violating campaign laws. Star-Advertiser. Bigger Fines Considered To Send Campaign Lawbreakers A Message. Candidates and political organizations may have to start paying more for filing their spending reports late or inaccurately. Civil Beat. ‘Fragile Aloha’: Why Hawaii’s Last Constitutional Convention Was Important. Delegates quickly broke into factions in 1978, but they ultimately made breakthroughs on Native Hawaiian issues. Civil Beat. Council rejects proposed bus, van hikes. Honolulu City Council members Wednesday shot down a plan by Mayor Kirk Caldwell to raise TheBus and TheHandi-Van fares starting Jan. 1. Star-Advertiser. A bill to dramatically increase the fines against those who flout city building codes won final approval from the Honolulu City Council Wednesday. Star-Advertiser. Ethics Board punts on honesty policy. Honesty may be said to be the best policy, but it’s not a policy the County Council, or the Board of Ethics, seems eager to see set in law. West Hawaii Today. On Tuesday, the Hawaii County Board of Ethics reviewed a County Council bill that would require local government to be “accurate and factual.” Big Island Video News. An autopsy on a 51-year-old tour guide who collapsed and died while leading a lava tour hike near Kalapana on Feb. 1 found the man’s death was accidental. The report found the immediate cause of death for Sean King was “thermal injuries and volcanic fume exposure.” Tribune-Herald. 'We're very, very fortunate.' Maui's mayor optimistic despite damage from Olivia. While much of the rain from Olivia has moved off, the focus now is dealing with the damage left behind. KHON2. Tropical Storm Olivia made history Wednesday as the first such storm to make landfall on Maui in modern times. Thankfully for residents and visitors on the Valley Isle, it was a brief and not particularly hard landing. Star-Advertiser. Heavy rains and strong winds from Tropical Storm Olivia pummeled Maui County on Wednesday, washing away homes, bringing down trees and utility poles, and triggering widespread power outages. Hawaii News Now. Olivia Maui Photos: Historic Landfall Made on Maui and Lanai. Maui Now. Despite concerns about water, wildfires and access to the Lahaina Pali Trail, the Maui Planning Commission gave a nod Tuesday to advance a 21-lot Maalaea agricultural subdivision. Maui News. Kalalau Trail closure redirects visitors elsewhere on Kauai. With Kee Beach and the Kalalau Trail closed, there are a few thousand tourists every day looking for somewhere else to go. Garden Island.